This music clip is from the CD entitled "West Coasting". The band was directed by Dr. Robert Washut. "Oclupaca" (2002). 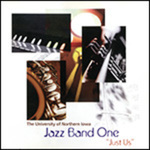 Jazz Band One. 46.